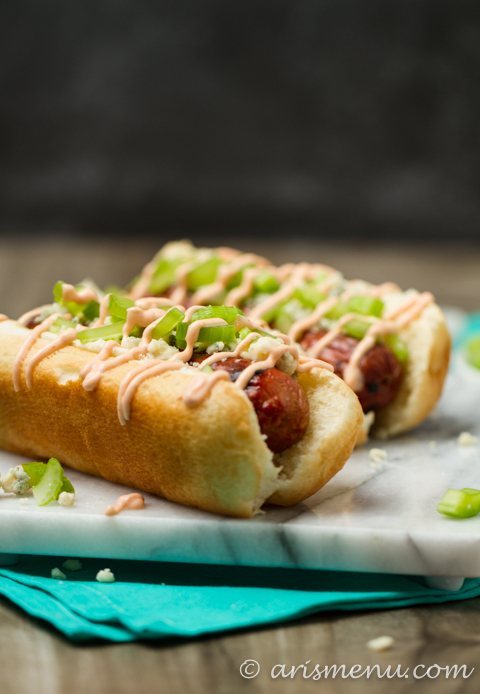 Spicy and flavorful, buffalo sauce meets hot dogs for the perfect easy grill or tailgating recipe that will satisfy all the men in your life while still maintaining secretly healthy ingredients! Ummm, is it really Monday again already? Last week I had Monday AND Tuesday off because Arizona apparently can’t handle rain and the entire Phoenix metro area was basically flooded. Well, it was flooded on Monday. I have no idea why we didn’t have school on Tuesday, but I’m not complaining. I do have to say that it made going back to work on Wednesday, like, ridiculously hard, and now I can’t believe I have to work a real 5 day week. My life is so hard. I have been the worst about meal planning. When I’m good, I’m so good, and I’m making new recipes multiple times per week, and saving money, and eating great dinners! But then I get busy, and the next thing I know, Steve and I are riding our bikes at 7:3o pm in the dark, and we’re both starving and have no idea what we’re going to eat for dinner. That night, I remembered when we were about 3 miles from home that we still had hot dogs in the freezer, and it was pretty much the happiest moment of my life. I freaking love hot dogs. It’s silly, but I do. 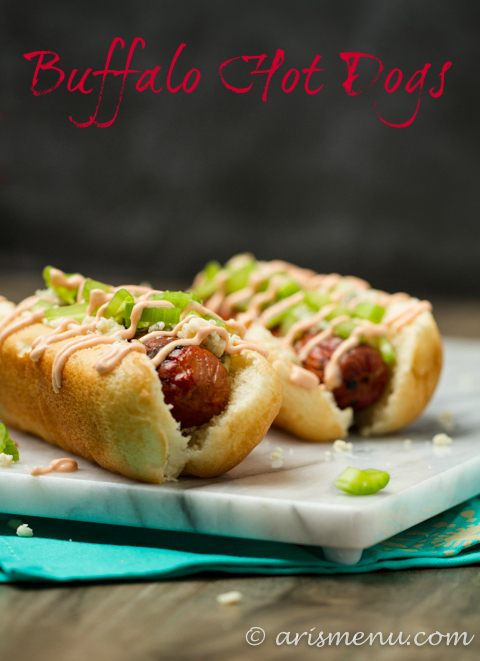 They’re so easy, and so delicious, and the possibilities are endless! This meal comes together in about 3 seconds. Okay, more like 10 minutes, but that might as well be 3 seconds when it comes to a delicious dinner! 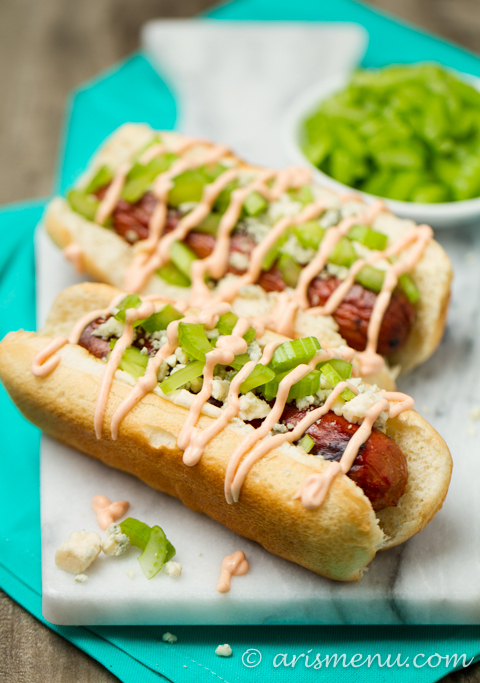 Just a few minutes to grill the hot dogs, mix together the sauce, and chop some celery and you are done! That’s how I like my dinner. Ready before I have a chance to back out on cooking and head to Chipotle. Also, about a million bold flavors is a necessity. I think I’m the opposite of a super taster. Like, I need to taste ALL OF THE THINGS in order to be happy. So if you’re anything like me, these will make you happy too! 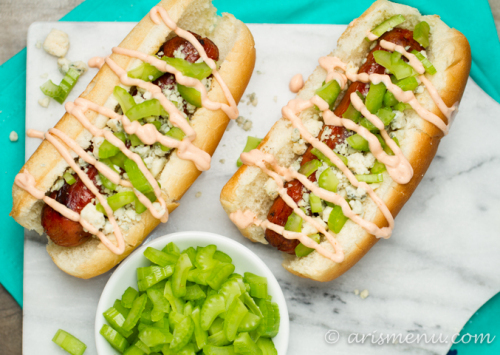 Spicy and flavorful, buffalo chicken meets hot dogs for the perfect easy grill or tailgating recipe that will satisfy all the men in your life while still maintaining secretly healthy ingredients! Grill hot dogs over medium heat until warmed throughout, about 5 minutes. 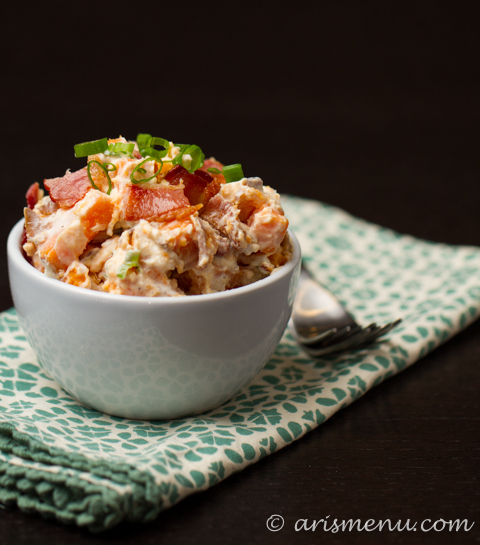 In a medium bowl, whisk together Greek yogurt, buffalo sauce and ranch seasoning. 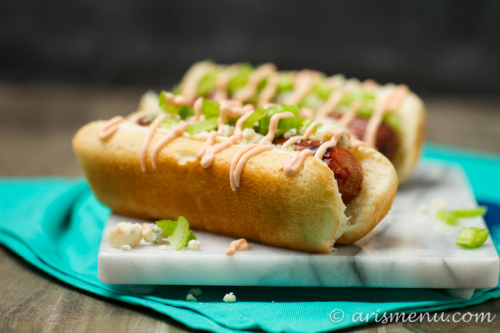 Drizzle cooked hot dogs with prepared Greek yogurt buffalo sauce. Top with chopped celery and blue cheese. Serve immediately. *I try to look for a lower in fat turkey or beef dog that is nitrate free. I especially love Fork in the Road (disclosure: they have sent me products in the past, but I loved them even before that!). 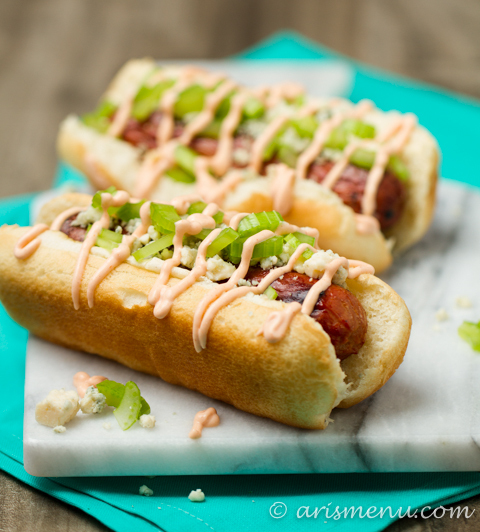 Also, not all hot dogs are gluten-free. If you eat gluten-free, be sure to check the labels. 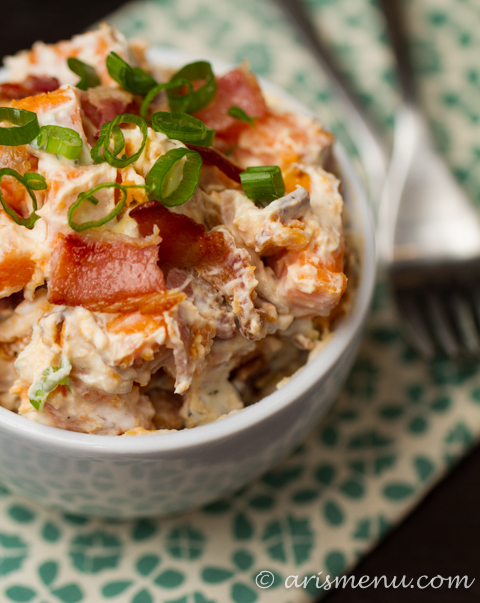 A healthy twist on a loaded baked sweet potato and potato salad. Looking for more sweet potato recipes? Check these out! Last month we hosted a barbecue at our house. I like to do a BYOM&B (bring your own meat & booze)–I make all the sides and desserts, and everyone can choose their own meat (or non-meat) and whatever they want to drink. It saves a lot of money, and you don’t have to worry so much about numbers, RSVPs, etc. It can be more laid back, and it makes it easier to invite all your friends. 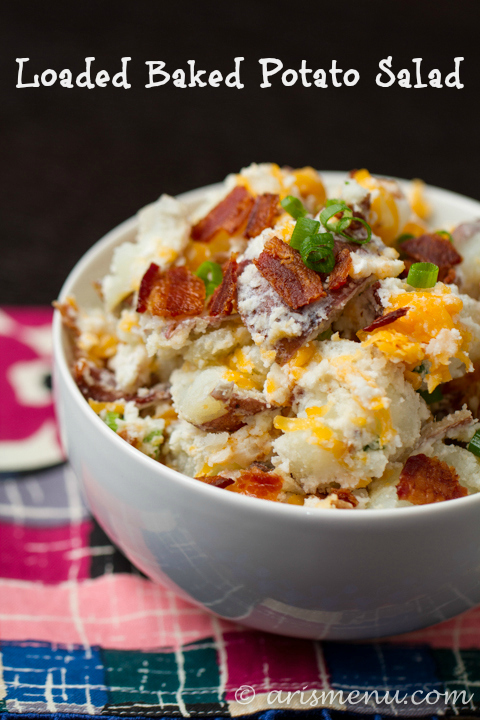 The recipe is super easy, and other than the time spent cooking the potatoes, it comes together in minutes. 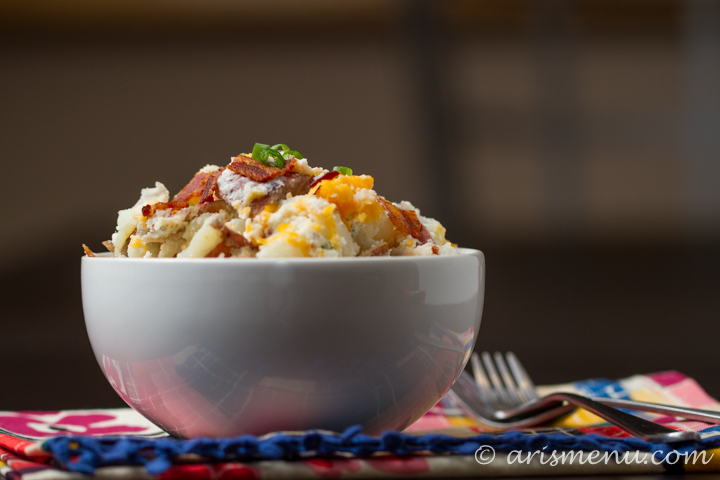 I just took a little spin with the concept of my loaded baked potato salad, and it was literally love at first bite. 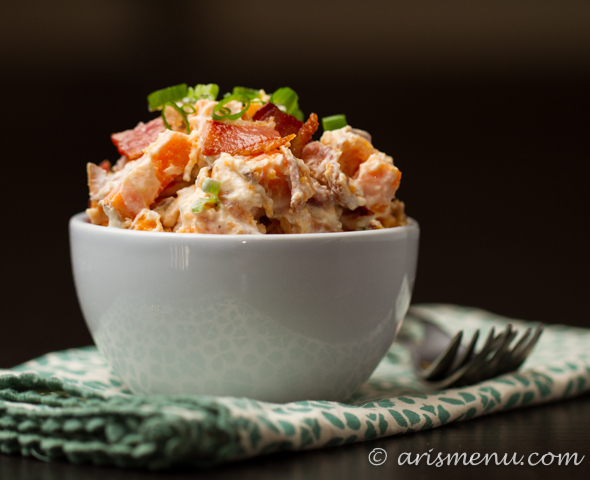 The sweetness of the sweet potatoes with salty bacon and tangy goat cheese…uggghhh–it’s just so right. 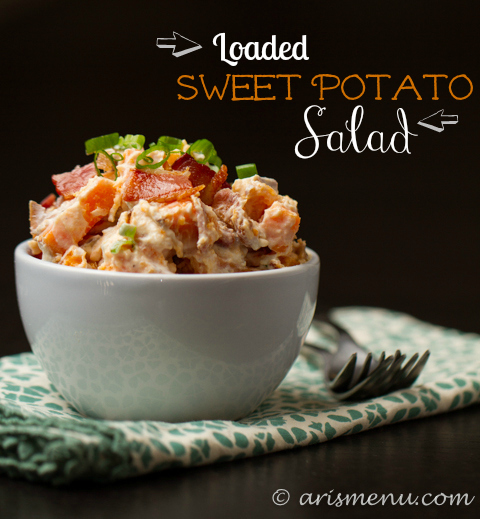 And I love how this is a side dish that’s perfect for all seasons–it’s perfect for a summer barbecue, but to me the sweet potatoes scream fall, and it’s such an easy dish to throw together that you can literally take it with you to just about any party, or even eat it as a meal for lunch! The Greek yogurt packs it with protein while the sweet potatoes add healthy carbs, and tons of vitamins. It’s literally the best of every world. Preheat oven to 400. 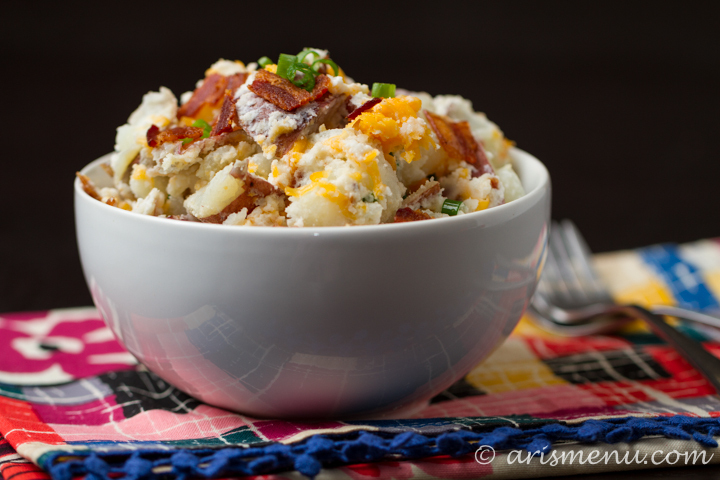 Pierce potatoes several times with a fork. Transfer to a large baking dish and cook until softened, about 45 minutes. Let cool for 15-20 minutes. Cut baked sweet potatoes into 1" cubes. Place all ingredients in a large bowl, and lightly toss until combined. 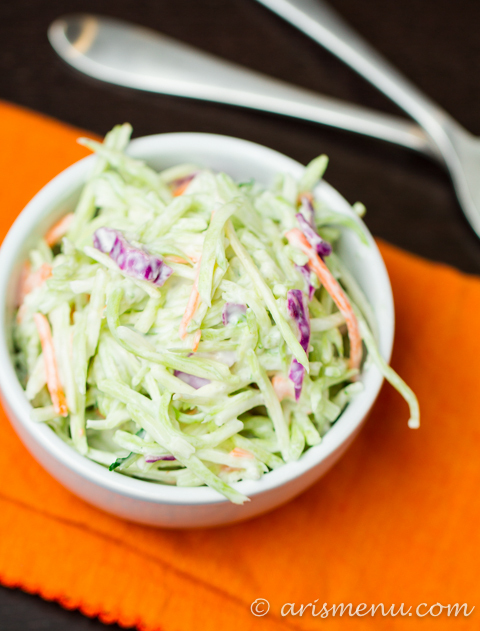 Serve immediately or store in an airtight container for up to 5 days. Anyway, let’s talk about food! Cookies, specifically. 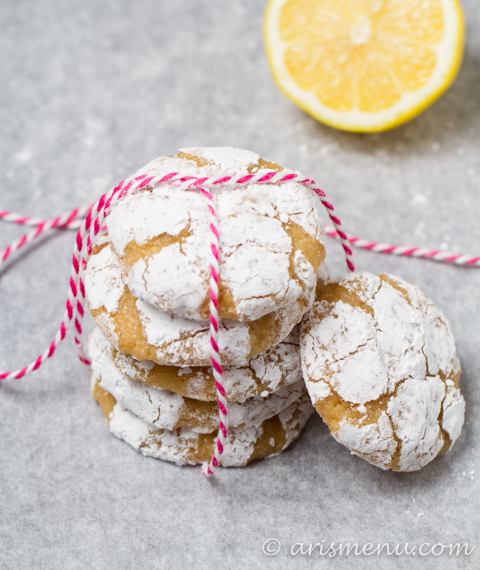 Perfectly tart and sweet, melt-in-your-mouth-soft lemon crinkle cookies. 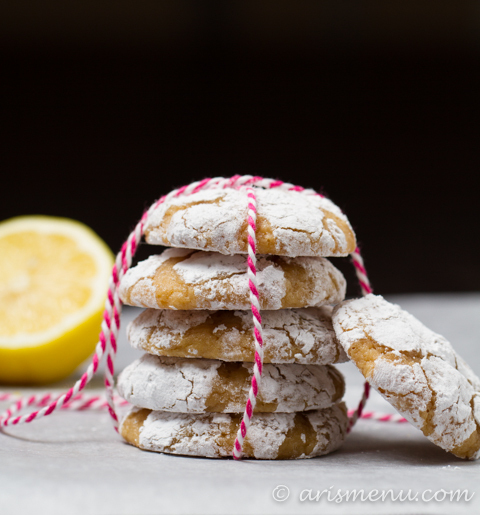 Uggghhhh, you guys…I can’t even explain to you how good these cookies are. They rival those Paradise Bakery gems that I’ve been obsessed with for years. They make you want to convert to lemon desserts forever. 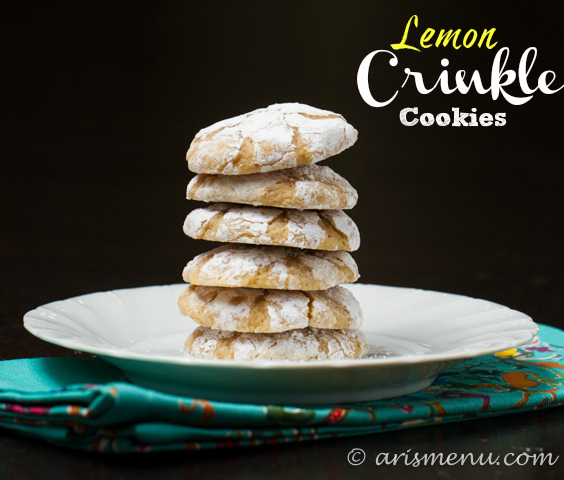 The combination of the lemon Greek yogurt + coconut oil = cookie texture perfection. Thick, soft and lightly chewy–you will never miss the butter! In a large bowl, beat together sugar and lemon zest until fragrant. Add coconut oil, yogurt, vanilla, egg and lemon juice. Beat until combined. Add flour mixture and beat until just combined. Cover and refrigerate for 30 minutes. Preheat oven to 350. Line baking sheet with silpat or parchment paper. Place powdered sugar in a large shallow bowl. Roll dough into approx 1" dough balls. Roll in powdered sugar to coat completely, then transfer to prepared baking sheet. Repeat with remaining dough. Bake for 10-12 minutes until edges gave just set. Allow to cool completely on baking sheet. Store in a loosely covered container for 5 days. Plain yogurt may be substituted if lemon is unavailable. 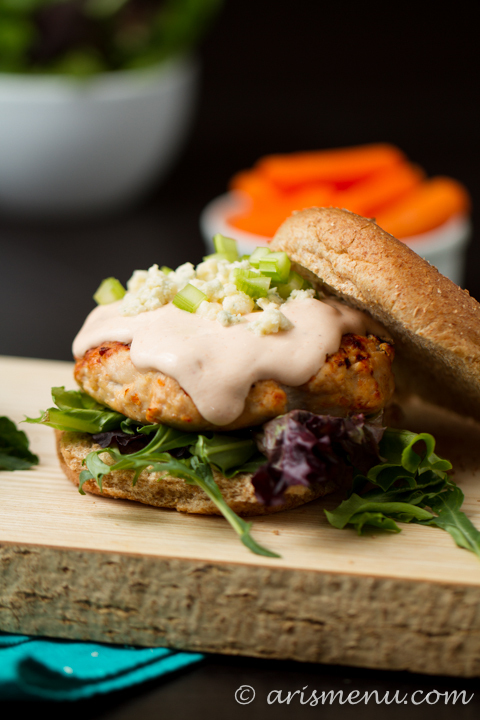 Bold and spicy buffalo turkey burgers topped with a creamy buffalo sauce and crumbled blue cheese. 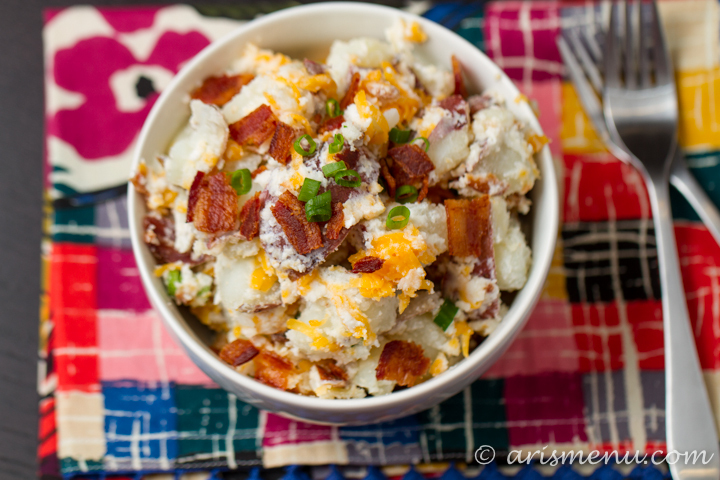 A simple, easy weeknight meal that everyone in your family will enjoy! Growing up, I always wondered “Why is my dad SO weird??? ?” He wore two different color socks, he was never on time, he listened to weird music, and he didn’t dress like any of the other dads. 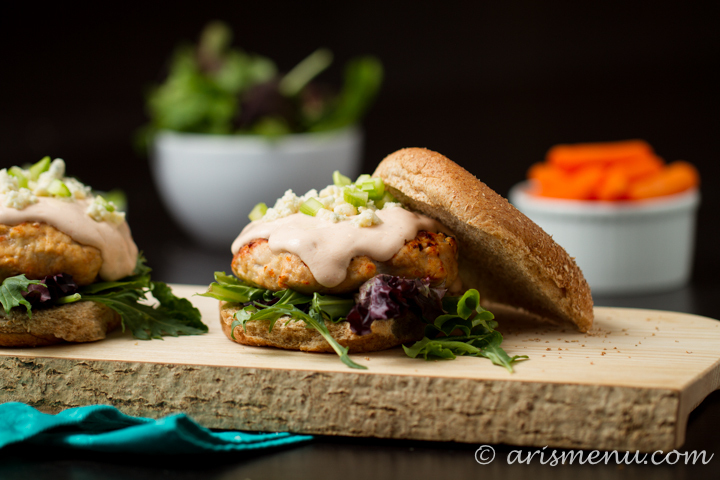 My dad doesn’t eat meat, so he would actually hate this recipe (sorry dad…), but I figured I’d pick a Father’s Day dish that most dads would appreciate, and most guys I know love a good burger. Maybe I was a man in a former life? Anyway, these would be perfect for (almost) any man in your life, and ummm you MUST go immediately over to Nicole’s blog to check out her BACON BROWN SUGAR OLD FASHIONED. Yes, I DID just say that. Best.Drink.Ever. Check out the latest episode of Drink & Dish to see the secret to making a perfectly cooked burger, and how Nicole makes the world’s best drink! 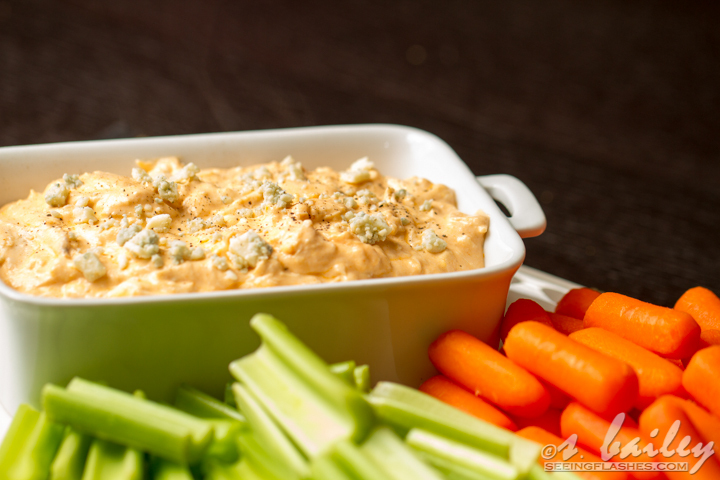 To make the buffalo ranch sauce, combine yogurt, buffalo sauce and ranch seasoning in a small mixing bowl. Set aside. 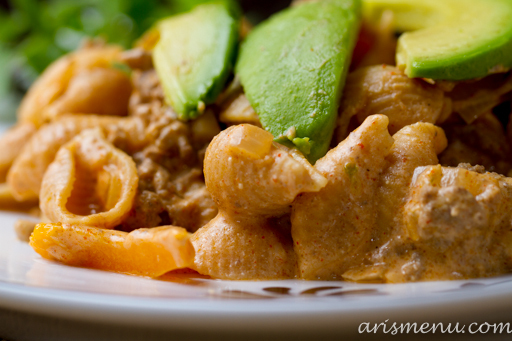 In a medium bowl, combine ground turkey with 2 tbsp buffalo sauce. Form into 4 equal-sized patties. Press your thumb down into the center of each patty to create a small indent. Grill over medium heat until completely cooked throughout, about 5-7 minutes each side. Transfer burgers to buns, and top each burger with about 2 tbsp buffalo ranch sauce, a handful of greens, and a tablespoon each of bleu cheese and celery. Serve immediately. 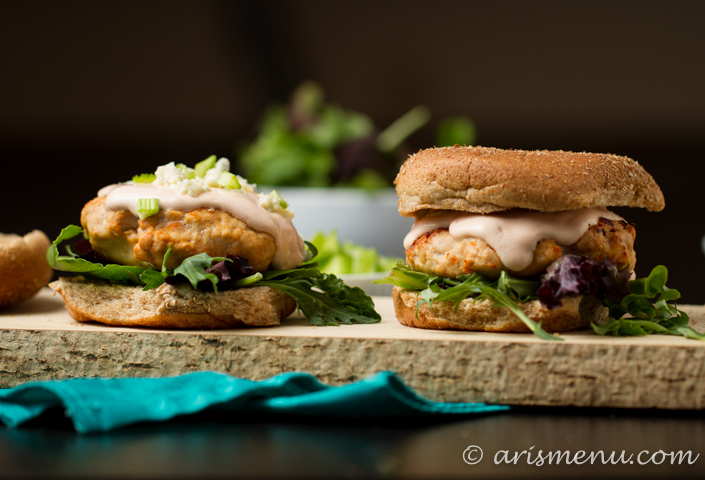 Leftover burgers and sauce can be stored in separate airtight containers in the fridge for 5-7 days. 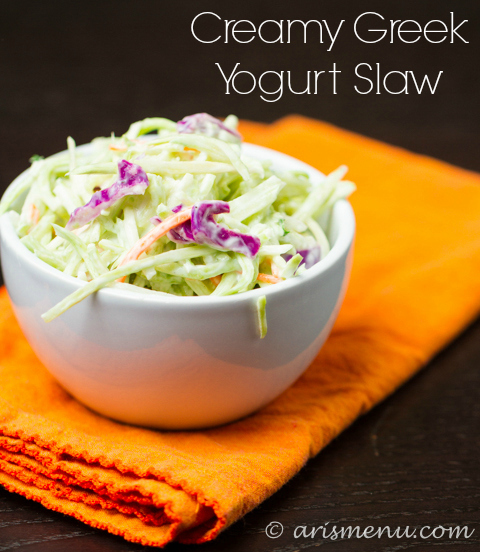 Taste the sauce before serving--if it is too spicy, add more yogurt. If it is not spicy enough add more buffalo sauce. Extra lean ground beef may be substituted for ground turkey. Buns may be omitted, and burgers may be served salad style if desired. I realllllly hope you like this recipe. I almost lost a leg creating it for you. I mean, “lost a leg” might be sliiiiightly dramatic, but I did end up with a pretty massive and nasty burn on my leg. I’ve had quite a few kitchen casualties recently, and I’m just considering it an opportunity to toughen up. I’m pretty much a wimp about hurting myself. I will push through tons of pain when I run, but the second I SEE the physical pain happen, I kind of cry like a baby. It’s not my best character trait, but I mean it could be worse, right? Ya know, for all my whining, this dish totallllly made up for it. I’ve made it before, but not for a long time, and with one bite I remembered just how dangerously delicious it was. In fact, after several days of nonstop picking at it and eating bites here and there, I finally had to throw in the towel and send the rest of the leftovers off with my family. The only time consuming part of this salad is waiting for the potatoes to bake. Literally, the rest is 5 minutes of throwing things together in a bowl. 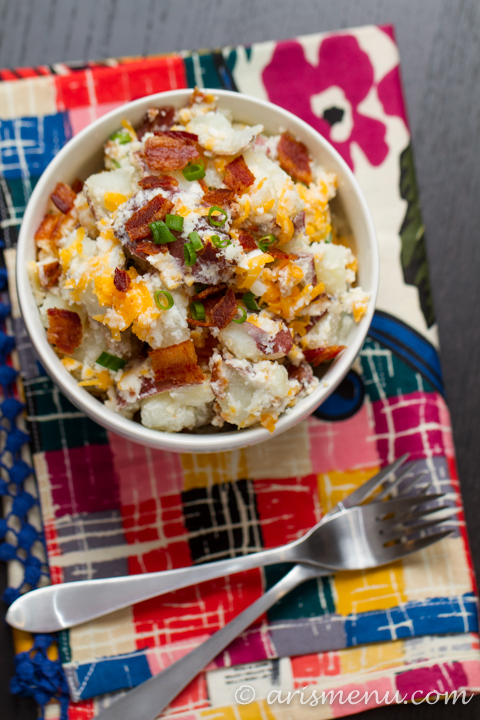 The flavors and textures come together perfectly with the starchy potatoes, creamy greek yogurt and crunchy, salty bacon. Make sure you check out the latest episode of Drink & Dish, and if you want a fun summer treat for Memorial Day or lounging by the pool, check out Nicole’s delicious vodka lemonade slush. 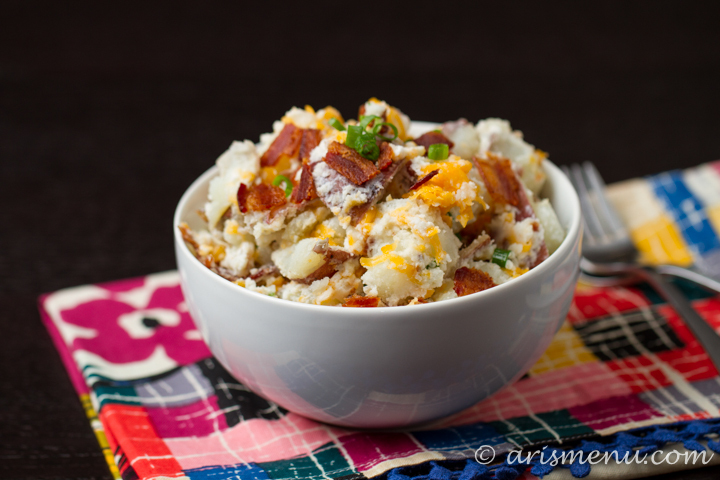 Simple, easy, and lightened up loaded baked potato salad perfect for summer BBQs. Preheat oven to 400. Pierce potatoes several times with a fork. Transfer to a large baking dish and lightly drizzle with olive oil. Cook until softened, about 45 minutes. Let cool for 15-20 minutes. Cut baked potatoes into 1" cubes. Place all ingredients in a large bowl, and lightly toss until combined. 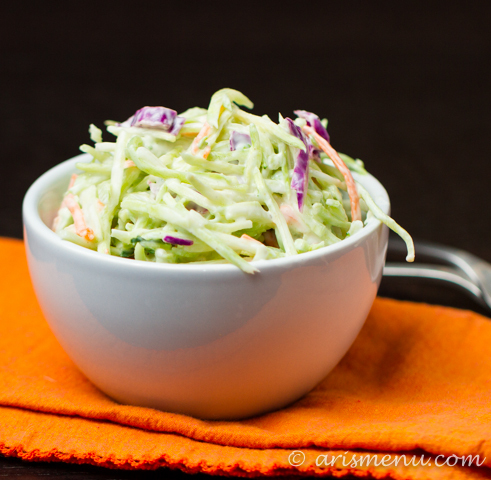 Serve immediately or store in an airtight container for up to 5 days. Have we ever talked about how I went from a fast food diet to Ari’s Menu? I could hardly boil water. My dad can’t even make spaghetti or boxes of Kraft mac & cheese. I grew up constantly eating out, and spent the first few years of college making grilled cheese sandwiches, heating up ramen noodles, and in the Jack in the Box drive through. When I moved home from Idaho, I had sparked an interest in cooking. I graduated to Hamburger Helper. It’s funny now, but I loved the stuff. I would swap out my ground turkey, and for me, that was “healthy cooking”. I guess I’ve come a long way in the last few years. 🙂 Just ask my mother in law about the time I tried to make gravy…. 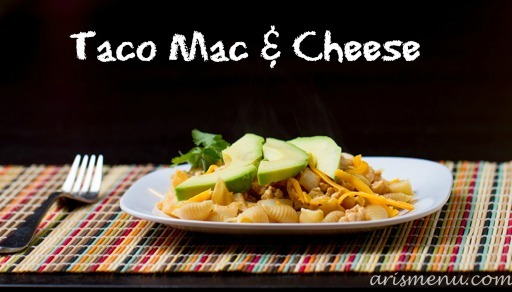 When the thought occurred to make taco mac & cheese, I didn’t realize that it was so similar to the Hamburger Helper I started out on, but it is similar–just a whole lot better. Real foods, tons of lean protein, and whole grains. Plus, it’s so simple that there is really no reason to cook from a box ever again! 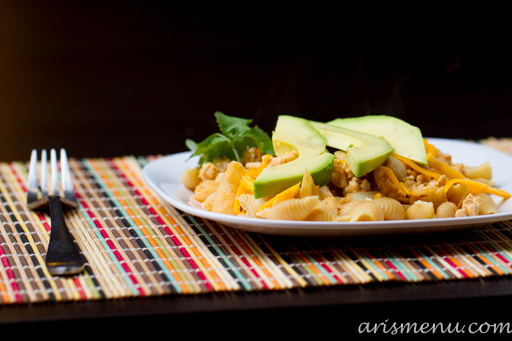 All of the flavors of macaroni and cheese mixed with bold spicy taco seasonings topped with creamy avocado for the perfect final touch. I loved this dinner so much I made it again not even a week later! That is unheard of for me. In a large pan over medium heat, saute onion, bell peppers, and garlic until tender, about 10 minutes. Add turkey and season with salt and pepper (about a pinch of each). Cook until turkey is browned, then remove from heat. In a medium pot, cook macaroni according to package instructions. Meanwhile, in a large pot, whisk together cream cheese and almond milk over medium-low heat until combined. Whisk in greek yogurt, taco seasoning, lime juice, and hot sauce. Stir in cheddar cheese until melted and combined. 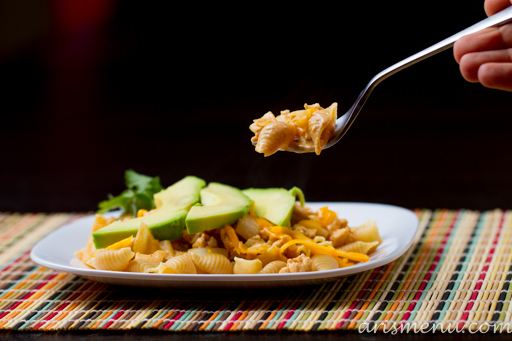 Stir turkey and veggies into sauce, then stir in cooked and drained pasta. 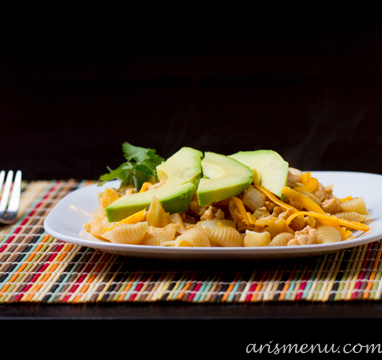 Top with sliced avocado and fresh chopped cilantro. Let’s talk for a second about making a video. It’s, um…hard. I naively assumed that I would be great at this, You see, I’m an actor. I have a degree in musical theatre. This is what I teach people to do all day long, right??? Well, as it turns out, it’s not quite that simple. Shocking, right? But it is a whole lot of fun! I believe it was the day that Nicole and I ran 21 miles that we decided to create our own internet cooking show. When we talk about food, we run faster. We spend a lot of time talking about food. I think the hardest part of this process for me was that my big, ridiculous, often over-the-top personality doesn’t always translate to a tiny little camera box. Nicole kept telling me I was shouting because I’m so used to having to project on stage, haha. It’s definitely a learning process, and there are quite a few things I want to work on for the next time (like, oh…actually plugging in our microphone and shooting in the hd format…whoops…), but I am pretty proud of what we put together. 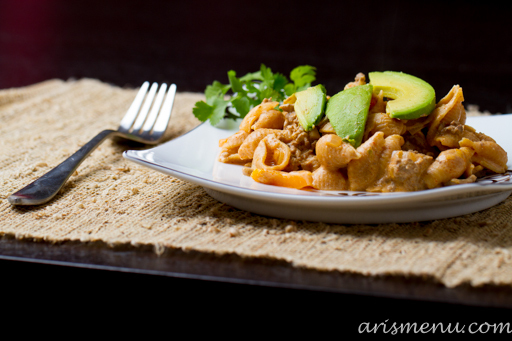 Make sure you go over to Nicole’s page to check out her recipe too! 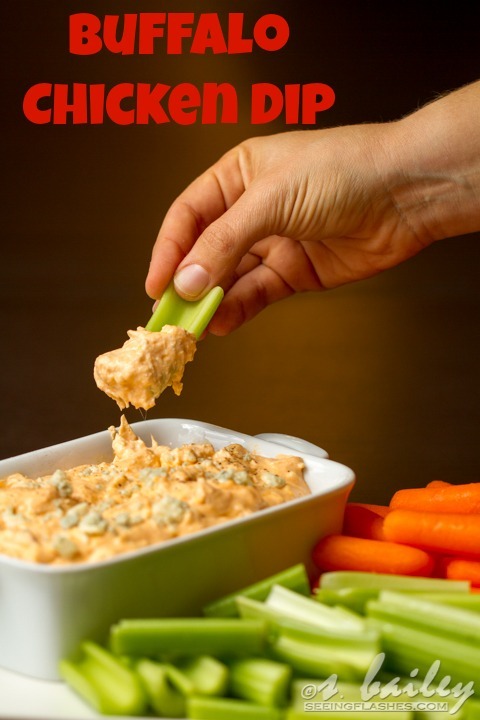 Combine chicken, cream cheese, Greek yogurt, cheddar cheese, ranch seasoning, and buffalo sauce in a medium sauce pan over medium heat. Stir constantly until all items are incorporated and dip is heated throughout, about 10-15 minutes. 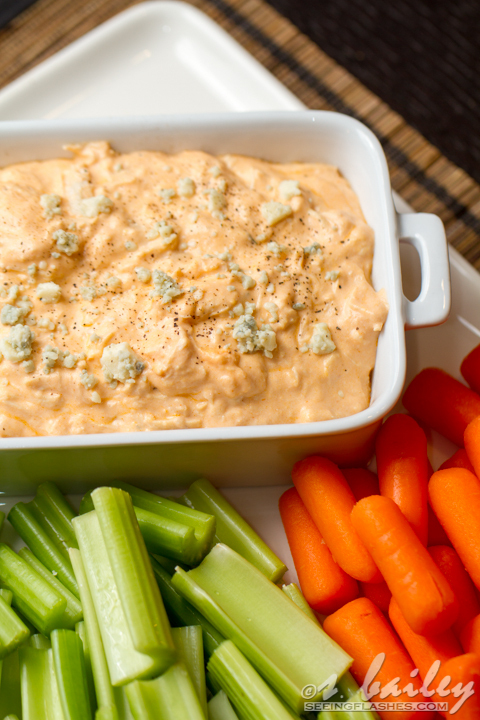 Serve topped with crumbled bleu cheese, with carrots and celery. 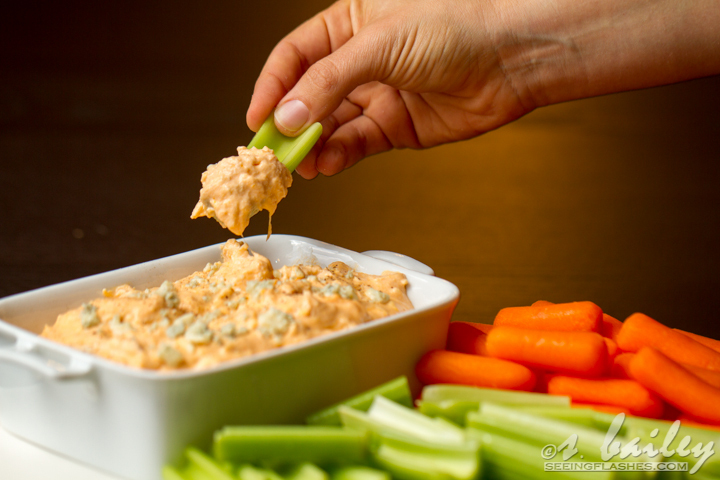 Dip can be stored in an airtight container in the refrigerator for one week, and reheated or eaten cold (if you’re weird like me 😉 ).